On the Campaigns page, you can use folders to organize your regular emails, ads, automations and other projects in Mailchimp. Whether you've already shared a campaign, or are still working on a draft, you can move it in and out of the folders you've created. In this article, you'll learn how to create, manage, and delete campaign folders. To create a folder for your campaigns, follow these steps. Name your new folder, and press enter. If you want to edit or rename your folder, place your cursor over the folder and click the pencil icon. You can move your campaigns from one folder to another, or you can organize your unfiled campaigns. Check the box next to each campaign you want to add to a folder. You'll see new options to Deselect All, Move To a folder, or Delete. Click Move To, and click the name of the folder where you want to add the campaigns. When you move an item into a folder, it will still appear in the full list on your Campaigns or Reports page. On the Reports page, automation campaigns will appear under the Automation tab. You can move items to a single folder at any time, but items can't be saved in multiple folders at once. If you delete a campaign, it will be removed from both the folder and the account, along with any associated data. To find all of your unfiled campaigns, follow these steps. 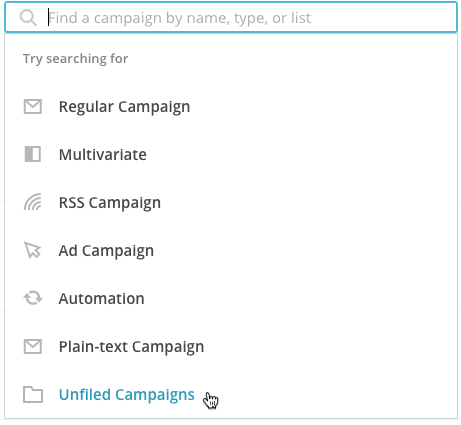 Click the search bar and choose Unfiled Campaigns. To delete a folder that you no longer need, follow these steps. Place your cursor over the folder you want to delete, and click the X icon. Click Delete Folder, But Keep Campaigns to remove the folder. The folder's campaigns will still be stored in your account. If you want to remove them, learn how to delete your campaigns.